"From the Ground Up is much more than I expected from a book about ground meat! I imagined I would be reading a book of glorified Hamburger Helper recipes, but this cookbook was far from that. From the Ground Up included a huge range of sophisticated ground meat recipes, with recipes that called for many different types of meat and seafood (although less common meats like rabbit and game birds were not included). Adventurous gourmands and picky eaters alike will find intriguing recipes in this book. Perfected versions of American classics like meatloaf and hamburgers will satisfy comfort food cravings, while crabmeat souffles and duck liver terrines will entertain more daring palates. The last chapter of From the Ground Up presents a challenge to ambitious home cooks who are interested in grinding and seasoning their own sausage at home. I was amazed to find out how many different ways ground meat could be used and how many cultures have created distinct dishes using ground meat. This cookbook is an eye-opening read for any carnivore!" "Coming from a household where meatloaf was on the dinner menu weekly, I've certainly had my fair share of ground meat dishes. But leave it James Beard-winning cookbook author James Villas to take simple, straightforward ground meat and show its universal appeal in From the Ground Up. Featuring dishes such as Turkish Lamb Burgers, French Seafood Quenelles, Greek Minted Meatballs and Irish Pork, Ham, Bacon Pub Loaf, his "world tour" of ground meat leaves no continent untouched. The huge array of recipes for soups, sides, sandwiches, casseroles, main dishes, and sausages represent so many different cultures, yet all are based on simple, inexpensive ground meats. If you've ever been interested in grinding your own meats, Villas provides plenty of insight on this DIY practice. For those meat-lovers out there who maybe haven't ventured much beyond their hamburger/meatball comfort zone, this tribute to ground meat is a must!" "After reading this cookbook, I will never view ground meat in the same way. From the Ground Up by James Villas elevates ground meats to a whole new level of culinary excellence. Sure, there are recipes for burgers and meatloaf here, but this cookbook clearly shines in highlighting the more unique ground meat options out there. Plus, I like that this book ventures outside ground beef and ground pork to include ground veal, ground chicken and even ground fish in the mix. Each recipe is sparsely laid out, which is great if you're a fan of minimalist cookbook design. Every page goes into depth about the history and the background of each dish, which makes this cookbook a delight to read as well. If you're interested in getting fancy with ground meats, then this is definitely the cookbook for you." 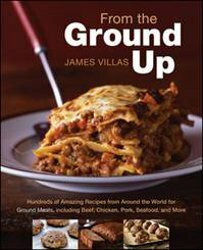 "James Villas' From the Ground Up is a world tour of eclectic, great recipes all using the beloved ground meat. From soups and salads, to sandwiches and casseroles, there are hundreds of recipes to choose from. Villas includes some age old classics like the American meatloaf and the ham and cheese casserole, but also ventures to foreign territory, with the Swedish Pitt i Panna Meat Hash. All presented with the passion for food, Villas chronicles each recipes origin and history. From the Ground Up pays tribute to the under-appreciated recipes of the world and displays John Villas admiration for fine dining. As informative as it is delicious, this cook book will take you on a world journey in the comforts of your own home." Enter the giveaway to win a copy of From the Ground Up.